In this recipe you’ll learn how to make a no-bake cheesecake by simply combining and mixing! 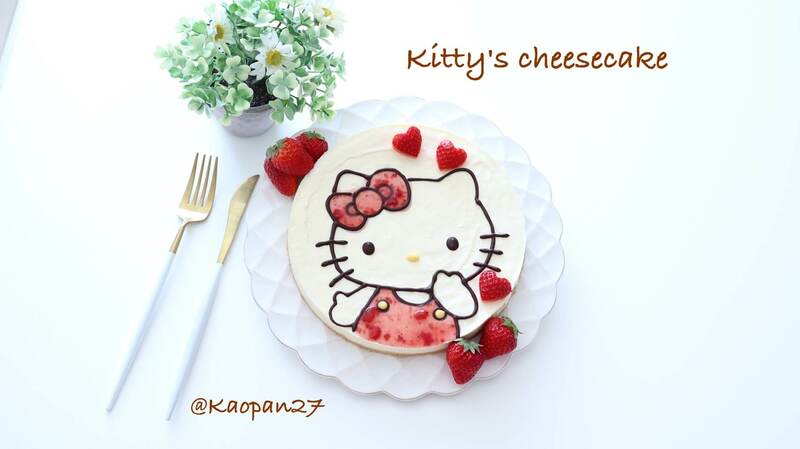 This easy recipe can be followed by anyone and can be easily changed into a character cake of your choosing. Chocolate plates are hard to make but if you follow these steps you’ll be able to make your own in no time! ・Add 5 tbsp water into the gelatin. Head it in the microwave for 40 seconds before combining with the cream cheese. 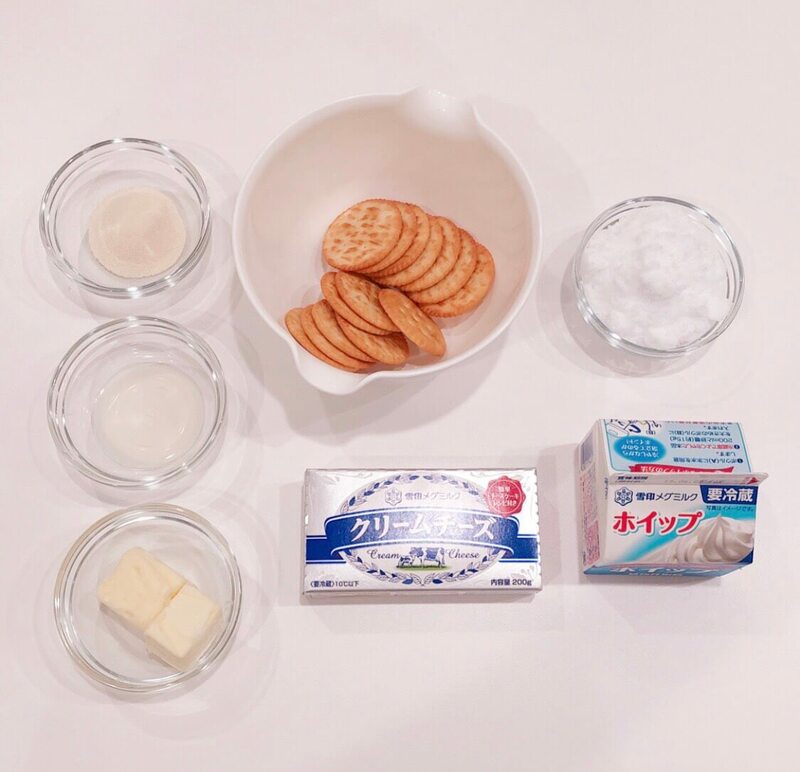 ・Let the cream cheese come to room temperature and then wrap the bowl in cling film before leaving to soften in the microwave. 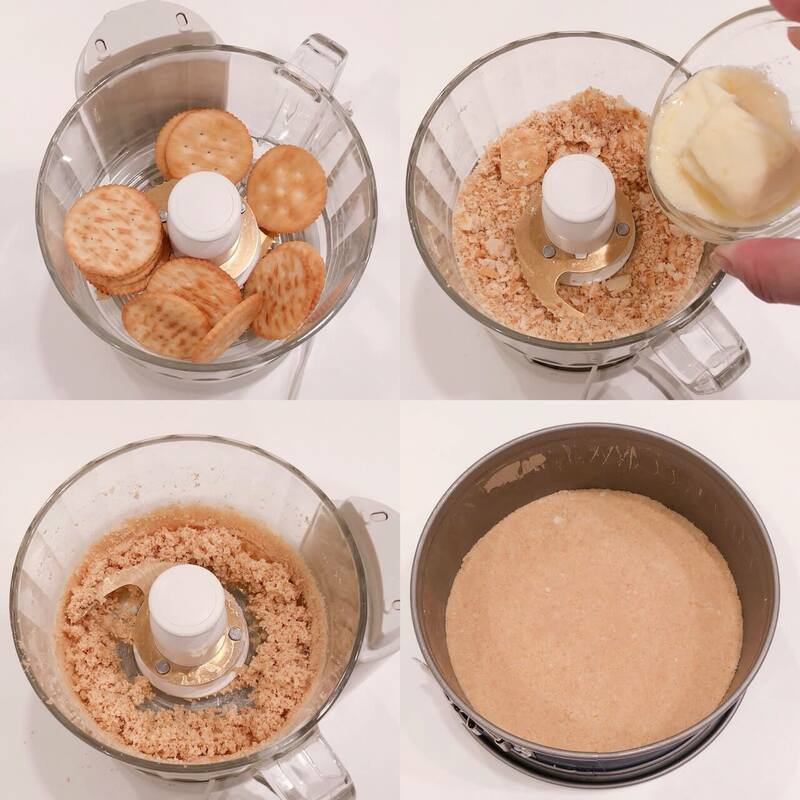 ①Blitz 10 crackers in a food processor and then pour in your melted unsalted butter. Add the other 10 crackers and blitz again. Add the mix into a cake tin. 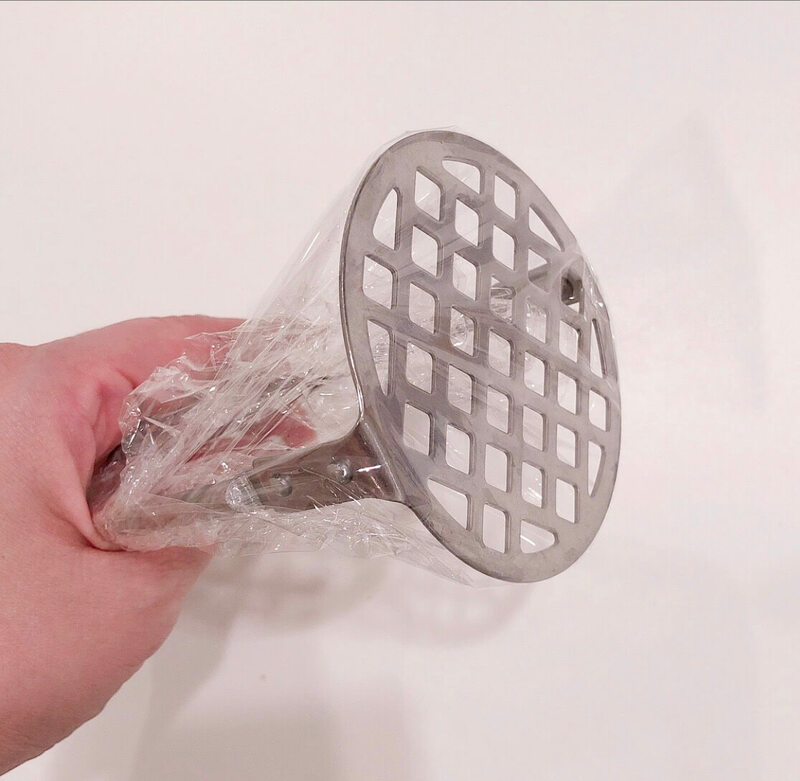 Wrap a potato masher in cling film like the photo below and press the mix. *By pressing multiple times with force at this stage it will prevent the biscuit from breaking later when the cake is cooked. 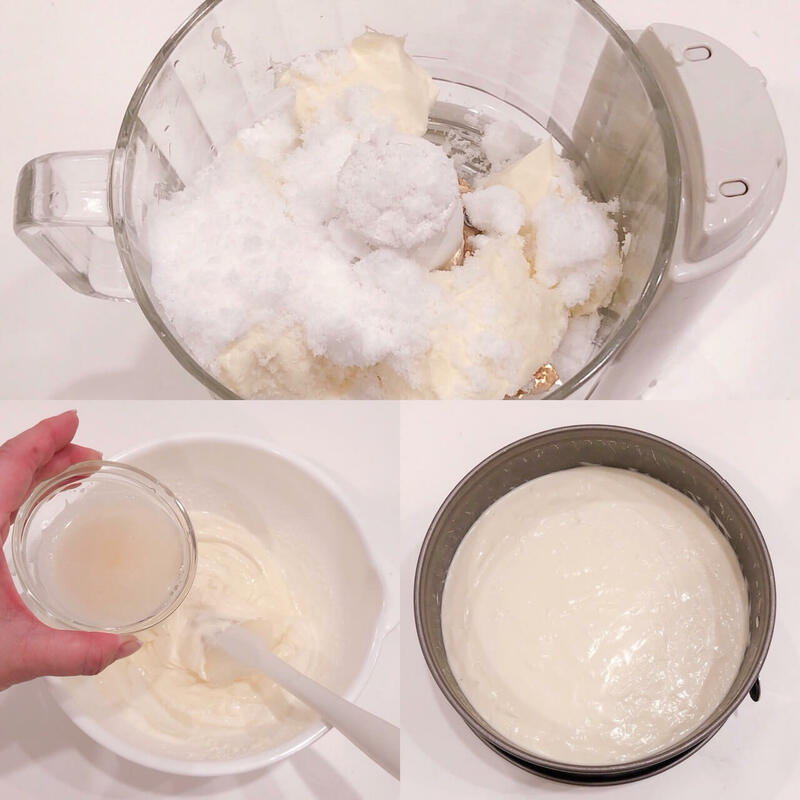 ①Blitz the cream cheese and sugar in the food processor to combine. ②Transfer the combined cream cheese and sugar into a bowl and add the lemon juice, fresh cream and the microwaved gelatin. ③Once fully mixed pour it on top of your cracker in the cake tin. Put into the refrigerator to fully cool and solidify. Your no-bake cheesecake is done! Next we need to draw Hello Kitty’s face. I made a video so check that out below too. 1: Get a picture of Hello Kitty (or character of your choice) and affix see-through baking paper on top with sellotape. 2: Trace the lines of the picture with a chocolate pen that has been warmed. *The fatter your lines the less likely it is to break when you put it on the cake. 3: Once you’ve finished drawing, place it into the refrigerator to harden. Once both the cheesecake and chocolate have cooled you can begin decorating. 4: Place the hardened chocolate on top of the cheesecake. *Don’t worry if your chocolate breaks a little when putting it on top. You can join the broken lines back up once you’ve placed it on so nobody will know. 5: Once the framework is on add the eyes and nose making sure to check the sizes and balance. 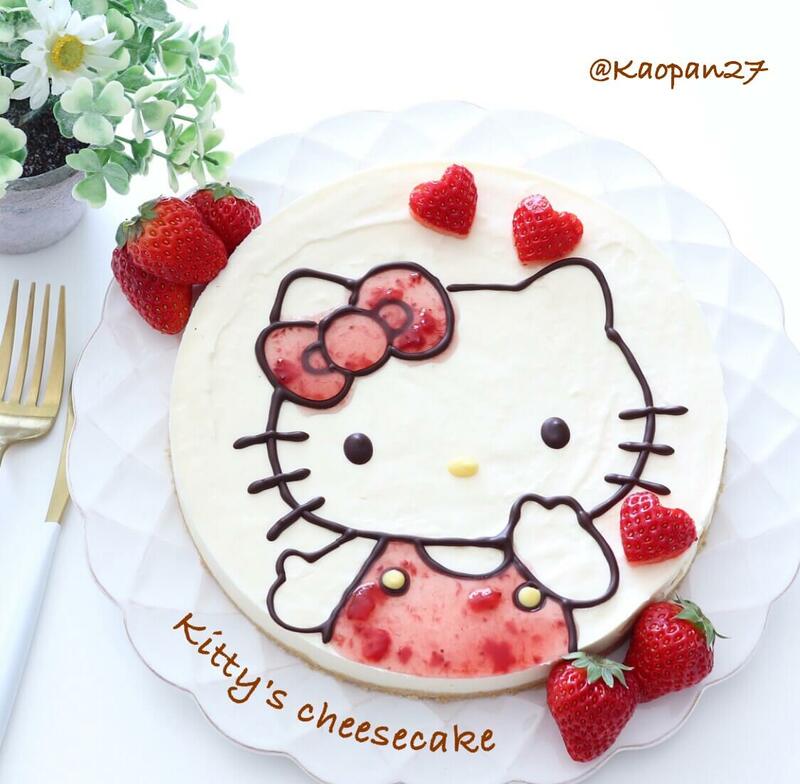 Finally, fill in the ribbon and clothing with either strawberry sauce or strawberry jam that has been mixed with a bit of water.